New Bayern Munich manager Carlo Ancelotti has no plans to rip up the foundations laid by predecessor Pep Guardiola and says he will look to continue the club's tradition of attacking football when the season kicks off in August. The Italian has large boots to fill as Guardiola, who switched to English Premier League side ManchesterCity this month, won three straight Bundesliga titles during his tenure at the Allianz Arena. "I know very well that the style of Bayern Munich is to play attacking football and we want to play attacking football. I love to play attacking football," Ancelotti told reporters on Monday. "I'm not here to make a revolution because the job that Guardiola did here was fantastic and I would like to follow his style. I don't think our style is going to change a lot compared to last year. The system will be more or less the same." Despite the domestic dominance, Guardiola's three-year spell at Bayern was not deemed entirely successful having missed out on the Champions League title. Ancelotti said it was impossible to predict whether he would do any better. "Of course everybody wants to win the Champions League, but only one team wins it," added Ancelotti, who is the only manager to have won the Champions League three times. 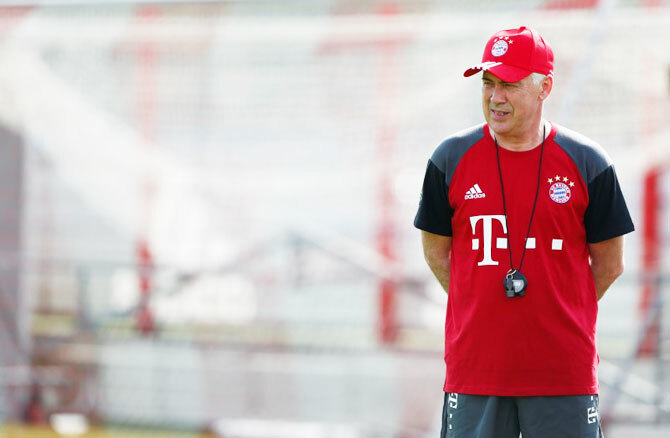 "I know that Bayern have a fantastic history in the Bundesliga and in the Champions League. The only thing that we cannot control is the result -- if I could control that too I would be a magician, but I'm only a manager." Having managed AC Milan, Paris St-Germain, Chelsea, Juventus and Real Madrid, Ancelotti said he had become accustomed to the pressure that comes with taking up a job with clubs targeting Champions League success. "A lot of people ask about the pressure -- I am used to it. I had the luck in my career of coaching top teams -- all top teams who want to win, but honestly I don't feel the pressure because I'm used to it," the 57-year-old said. Bayern kick off their title defence against Werder Bremen on August 26.